How add this block to index? In CMS I could not find it. And where is the button "add to friends"? I know, it is somewhere exist, but why it so far? That is not a block included in Icy Phoenix. Someone coded it to work inside a block there. Like Chicony said, you can add/remove friends in your profile. What version your running ?? You find this Block in your Profile. 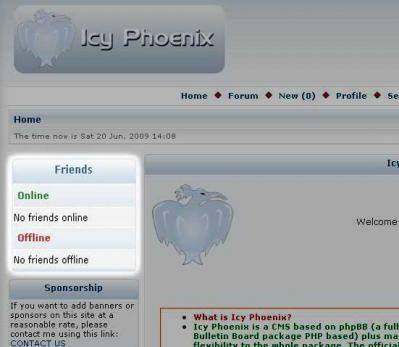 EDIT: So guys..How to implement "friends in Index"
and thankyou for making available to other members..
Can someone confirm if this works on the RC2 version of Icy Phoenix? no it s not fully functional in rc2 the lang files need to be aded to the php files.. so I would advise not to use until all the code edits are done..